JAMES ABRAM GARFIELD was born in a log cabin in Orange, Cuyahoga County, Ohio on November 19, 1831, the youngest of five children. His father, Abram Garfield, was a native of New York, but of Massachusetts ancestry, descended from Edward Garfield, an English Puritan, who in 1630 was one of the founders of Watertown. 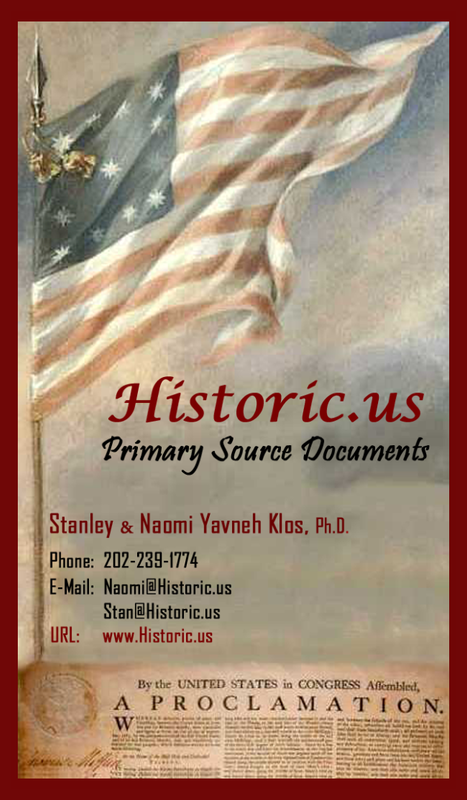 His mother, Eliza Ballou, was born in New Hampshire, of a Huguenot family that fled from France to New England in 1685. Abram Garfield moved his family to Ohio in 1830, and settled in what was then known as “The Wilderness”. Abram made a prosperous beginning as a farmer and a canal construction worker in his new home, but died at the age of thirty-three after a sudden illness. Eliza Garfield brought up her young family unaided in a lonely cabin and impressed on them he high standard of moral and intellectual worth. She displayed almost heroic courage. Hers was a life of struggle and poverty, but the poverty of her home differed from that of cities or settled communities – it was the poverty of the frontier and all shared it. James A. Garfield started school at the age of three, attending classes in a log hut and learned to read and began a habit of reading that would only end with his life. At ten years of age he was helping out his mother’s meager income by working at home or on the farm of the neighbors. Labor was play to the healthy boy and he did it cheerfully, for his mother’s hymns and songs sent her children to their tasks with a feeling that the work was honorable. By the time he was fourteen, young Garfield was fairly knowledgeable in arithmetic and grammar and was particularly interested in the facts of American history, having eagerly gathered information from the meager treaties that circulated in that remote section of Ohio. In fact, he read and reread every book the scanty libraries of his part of the wilderness supplied, and many he learned by heart. The tales of the sea especially thrilled Garfield and a love for adventure took over him. In 1848, at the age of seventeen, Garfield went to Cleveland and planned to work as a sailor on board a lake schooner. He soon realized that the life was not the romance he had envisioned. He did not want to return home without adventure and without money, so he drove for a few months for a boat on the Ohio canal. Little is known of this experience except that young Garfield secured a promotion from the towpath to the boat, and a story that he was strong enough and brave enough to hold his own against his fellow workers, who were naturally a rough group. In 1849, Garfield’s mother persuaded him to enter Geauga Academy in Chester, Ohio, which was about ten miles from his home. During his vacations he learned and practiced carpentry and helped at harvest, he taught and did anything and everything to get money to pay for his schooling. After his first term, he needed no aid from home, he had reached the point were he was self-sufficient. While at Chester, he met a Miss Lucretia Rudolph, his future wife. He was attracted at first by her interest in the same intellectual pursuits, and he quickly discovered sympathy in other tastes and a congeniality of disposition, which paved the way for the one great love of his life. He was himself attractive at this time, and he exhibited many signs of intellectual superiority and was physically a splendid specimen of vigorous young manhood. He studied hard, worked hard, cheerfully ready for any emergency, even that of the prize ring; for, finding it a necessity, he one day thrashed the bully of the school in a stand up fight. His nature, always religious, was at this period profoundly stirred in that direction. He was converted under the instructions of a Campbellite preacher, was baptized and received into that denomination. They called themselves “The Disciples” condemned all doctrines and forms and sought to direct their lives by the Scriptures, simply interpreted, as any plain man would read them. This sanction to independent thinking given by religion itself had great influence in this young man that kept his earnest nature out of the ruts of bigotry. From this moment, his zeal to get the best education heightened and he began to take wider views, to look beyond the present and into the future. In 1851, after finishing his studied in Chester, he entered the principal educational institution of the Campbellites, Hiram Eclectic Institute (later Hiram College). He was not a very quick study, but he was determined and he soon had an excellent knowledge of Latin and was fairly adept in algebra, natural philosophy and botany. He read with appreciation, but his superiority was easily recognized in the debating societies of the college, where he was industrious and outstanding. Living at Hiram was inexpensive, and he easily made his expenses by teaching in the English departments, and also gave instruction in the ancient languages. After three years, Garfield was well prepared to enter the junior class of any eastern college, and he had saved $350 toward the expense. He hesitated between Yale, Brown and Williams colleges, finally choosing Williams on the kindly promise of encouragement sent him by its president, Mark Hopkins. It was natural to expect Garfield would choose Bethany College, in West Virginia, an institution largely controlled and patronized by the Campbellites. Garfield himself felt the need to explain his choice, giving the reasons that Bethany was too friendly in opinion to slavery, that Bethany was not as extended as were the New England colleges; and most significant of all – that he had both by birth and by association, held a strong bias toward the religious views of Bethany, he ought to examine other faiths. James A. Garfield entered Williams in the autumn of 1854 and graduated with the highest honors in the class of 1856. His classmates joined with President Hopkins in testifying that in college he was warm hearted, large minded and possessed a great earnestness of purpose and a singular poise of judgment. But outside of these and other like qualities such as industry, perseverance, courage, modesty, unassuming manners, and conscientiousness, Garfield hand exhibited up to this time no signs of the superiority that was to make him a conspicuous figure. The effects of twenty-five years of the most varied discipline, cheerfully accepted and faithfully used, begin to show themselves and to give to history one of its most striking examples of what education – the education of books and circumstances – can accomplish. Garfield was not born, but made; and he made himself by persistent, strenuous, conscientious study and work. In the next six years, he was a college president, a state senator, a major general in the National army, and a representative-elect to the National congress. No other American president had received so many rapid and varied promotions. On his return to Ohio after his graduation in 1856, he resumed his place as a teacher of Latin and Greek at Hiram, and the next year (1857) being then only twenty-six years of age, he was made its president. He was a successful officer, and ambitious beyond his allotted tasks. He discussed with his interested classes almost every subject of current interest in science, religion, education and art. The story spread, and his influence with it; he became an intellectual and moral force in the Western Reserve. His influence was greatest, however, over the young. They became infected with his thirst of knowledge, his sympathy, his manliness and his veneration for the truth when it was found. As an educator, he was, and always would have been eminently successful; he had the knowledge, the art to impart it, and the personal magnetism that impressed his love for it upon his pupils. His intellectual activity at this time was intense. The laws of his church permitted him to preach, and he used the permission. He also pursued the study of law, entering his name, in 1858 as a student in a law office in Cleveland, but studied in Hiram. 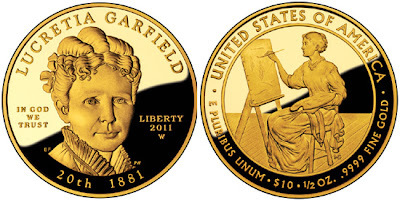 On November 11, 1858, James A. Garfield married Lucretia Rudolph, his fellow student at Geauga Academy. The couple had seven children: Eliza A. Garfield (1860-63); Harry A. Garfield (1863-1942); James R. Garfield (1865-1950); Mary Garfield (1867-1947); Irvin M. Garfield (1870-1951); Abram Garfield (1872-1958); and Edward Garfield (1874-76). To one ignorant of the slow development of Garfield in all directions, it would seem incredible that he now for the first time began to show any noticeable interest in politics. He seems never to have even voted before the autumn of 1856. No one who knew the man could doubt that he would then cast his vote for the first Republican candidate for the presidency, John Fremont. As moral questions entered more and more into politics, Garfield’s interest grew apace, and he sought frequent occasions to discuss these questions in debate. In advocating the cause of freedom against slavery, he showed for the first time a skill in discussion that afterward bore good fruit in the House of Representatives. Without solicitation or thought on his part, in 1859, he was sent to represent the counties of Summit and Portage in the senate of Ohio. Again in this new field his versatility and industry are outstanding. He makes exhaustive investigations and reports on such widely different topics as geology, education, finance and parliamentary law. Always looking to the future, and apprehensive that the impending contest might leave the halls of legislation and seek the arbitrage of war, he gave special study to the militia system of his state and the best methods of equipping and disciplining it. The Civil War came, and Garfield, who had been a farmer, carpenter, student, teacher, lawyer, preacher and legislator, was to show himself an excellent soldier. In August 1861, Governor William Dennison commissioned him lieutenant colonel in the 42nd regiment of Ohio volunteers. The men were his old pupils at Hiram College, whom he had persuaded to enlist. Promoted to the command of this regiment, he drilled it into military efficiency while awaiting orders to the front. 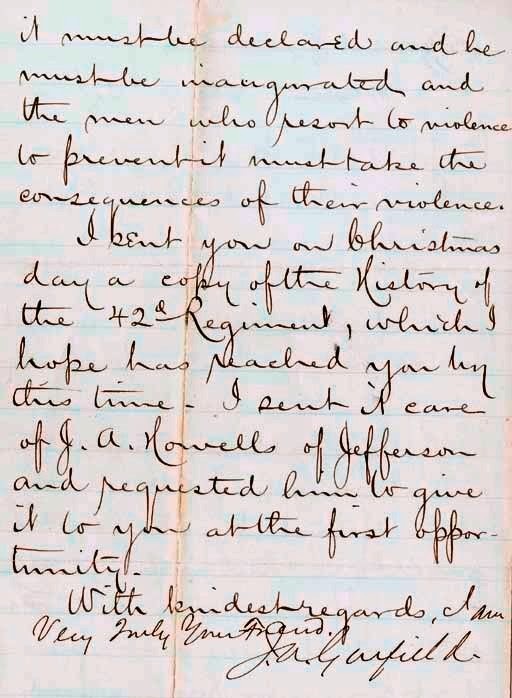 In December, 1861, he reported to General Buell in Louisville, Kentucky. General Buell was so impressed by the soldierly condition of the regiment that he gave Colonel Garfield a brigade, and assigned him the difficult task of driving the confederate general Humphrey Marshall from eastern Kentucky. Buell’s confidence was such that he allowed the young soldier to lay his own plans, though on their success hung the fate of Kentucky. The undertaking itself was difficult. General Marshall had 5,000 men, while Garfield had only half that number, and must march through a state where the majority of the people were hostile, to attack an enemy strongly entrenched in a mountainous country. 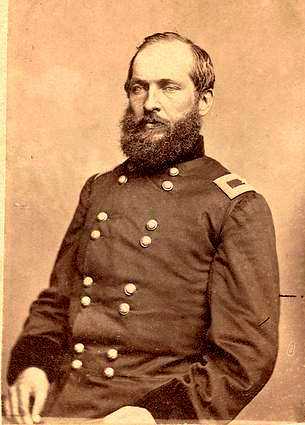 Garfield, not daunted at all, concentrated his little force and moved it with such rapidity, sometimes here and sometimes there, that General Marshall was deceived by his moves and still more by false reports which were skillfully prepared for him. Marshall abandoned his position and many of his supplies at Paintville, and was caught in retreat by Garfield, who charged the full force of the enemy and maintained a hand-to-hand fight with it for five hours. The enemy had 5,000 men and 12 cannons; Garfield had no artillery and but 1,100 men. Garfield held his own until reinforced by Generals Graner and Sheldon, when Marshall gave way, leaving Garfield the victor at Middle Creek, January 10, 1862, one of the most important of the minor battles of the war. Shortly afterward the Confederates lost the state of Kentucky. In recognition of his service, President Lincoln made the young Garfield a Brigadier General dating his commission from the battle of Middle Creek. During Garfield’s campaign of the Big Sandy, he was engaged in breaking up some scattered Confederate encampments, his supplies gave out and he was faced with starvation. Going himself to the Ohio River, Garfield seized a steamer, loaded it with provisions and on the refusal of any pilot to undertake a perilous voyage (the river was high and running very fast), he took the helm and for forty-eight hours piloted the craft through the dangerous channel. In order to surprise Marshall who was then entrenched in Cumberland Gap, Garfield marched his soldiers 100 miles in four days through a blinding snowstorm. Returning to Louisville, he found that Buell was away, and overtook him at Columbia Tennessee and was assigned to the command of the 20th Brigade. He reached Shiloh in time to take part in the second day’s fight, was engaged in all the operation in front of Corinth, and in June, 1862, rebuilt the bridges on the Memphis and Charleston railroad, and exhibited noticeable engineering skill in repairing the fortifications of Huntsville. The unhealthfulness of this region overcame Garfield, and on July 30, 1862, he returned to Hiram, under leave of absence, where he lay ill for two months. After regaining his strength, Garfield reported to Washington and was ordered to court-martial duty, and gained a very respectful reputation in this practice. Garfield was returned to duty under General Rosencrans who made him his chief of staff, with responsibilities beyond those usually given to this office. After the Union loss at the Battle of Chickamauga, Garfield volunteered to take news of the defeat to General George H. Thomas, who held the left of the line. It was a bold ride, under constant fire, but he reached Thomas and gave the information that saved the Army of the Cumberland. For this action he was made a major general on September 19, 1863, promoted for gallantry on a field that was lost. With a future military career so bright before him, Garfield, always unselfish, yielded his own ambition to a request by Mr. Lincoln that he hasten to Washington to sit in Congress. Garfield had been chosen fifteen months before as the successor of Joshua R. Giddings. 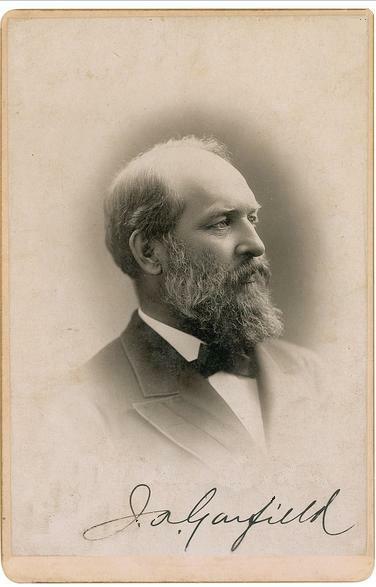 James A. Garfield was thirty-two years old when he entered congress. In December 1863, he started his first term as a representative for his home district. He was reelected for eight successive terms to the same office. His military reputation had preceded him and secured for him a place in the Committee on Military Affairs, then the most important in congress. Garfield was a loyal Republican. He favored a policy of “hard money” the principle that all paper money issued by the government should be secured by gold or silver. After the Civil War he sided with the radical faction of the Republican Party, supporting seizure of the property of those who had served the Confederacy and demanding voting rights for blacks. In 1865, Garfield, at his own request, was changed from the Committee on Military Affairs to the influential Ways and Means Committee. He soon became a power in his party. In 1876, James G. Blaine of Massachusetts resigned his seat to serve in the Senate. James A. Garfield assumed the Republican leadership in the House. During his rise to power, Garfield was connected to two incidents that tarnished his record, one involving an alleged bribe to delay a congressional investigation of Credit Mobilier Company, which had made illegal profits fro government contracts. The other involved accepting fees from a company trying to obtain a paving contract for Washington, D.C. Garfield denied all charges but remained his own harshest critic that he had not shown his usual cautiousness in avoiding any connection with any matter which could come up for congressional review. 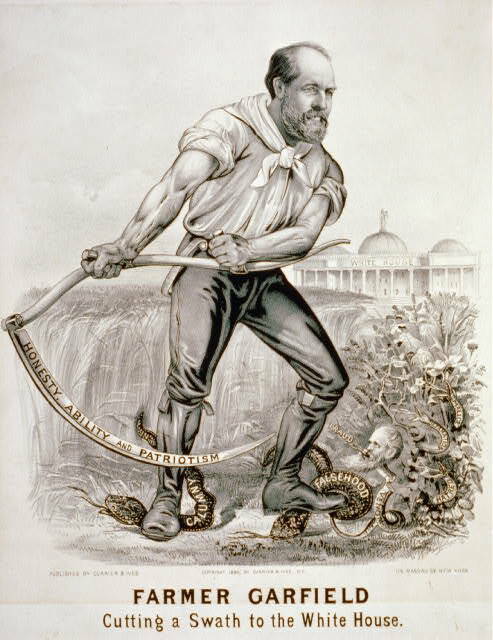 His Ohio constituents knew both scandals in 1874, but he was reelected for another term. James A. Garfield (1831-1881). Letter signed ("J. A. Garfield"), as Member of House of Representatives, to Capt. A. W. Stiles, Washington, D. C., 28 December 1876. 2 pages, 8vo, on House of Representatives stationery. Garfield expresses alarm over the Disputed Hayes-Tilden Election. An important commentary on this deadlocked 1876 election. "We do not yet know precisely what the Democrats mean," Garfield says, "but they talk as though they mean mischief. We must stand firmly by the law and maintain our rights in the case. If, when the votes are counted, it does not appear that Governor Hayes is fairly elected no man would wish to see him declared so. But if he has been fairly elected it must be declared and he must be inaugurated and the men who resort to violence to prevent it must take the consequence of their violence..."
James A. Garfield was elected the United States Senator from Ohio in 1880. Before his term began, he became involved in the presidential campaign of 1880. He supported Secretary of the Treasury, John Sherman, another Ohioan, and was head of his state’s delegation and manager of the Sherman campaign at the Republican national convention. He worked hard to win convention delegates for Sherman. He was chairman of the rules committee and he persuaded the convention to permit delegates to vote individually rather than in state blocks. This system freed many delegates from party dictated support, however, no candidate was able to muster a majority. Garfield addressed the convention on behalf of Sherman, but he spoke for 15 minutes before he mentioned Sherman’s name. Many suspected that Garfield was placing himself in nomination and he probably won more cheers for himself than for his candidate. There is no evidence to suggest that he was disloyal to Sherman but finally on the 36th ballot on the convention’s sixty day, Garfield himself was nominated for president. Chester A. Arthur, a former customs collector of the Port of New York was nominated for vice president. Garfield won the election but he did not have a majority of the popular vote. He received 214 electoral votes to Democrat Winfield S. Hancock’s 155, however, his electoral margin came mainly for Northern states as he received 4,454,416 popular votes compared to Hancock’s 4,444,952. After the election Garfield surrendered his Senate seat to which he had been elected and he resigned from the House. He was inaugurated on March 4, 1881. Once in office, Garfield took a stand against political corruption. In May he won a showdown with a powerful New York Senator, Roscoe Conkling, with his choice of Conkling’s rival to head the New York Customs House. The early summer came and peace and happiness and the growing strength and popularity of his administration cheered Garfield’s heart. On the morning of July 2, 1881, the president was setting out on a trip to New England. He was passing through the waiting room of the Baltimore and Potomac railroad depot at nine o’clock in the morning with Mr. James G. Blaine, his close friend. 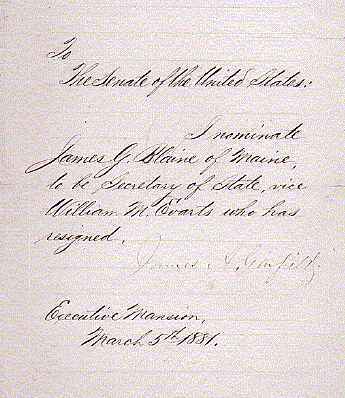 Charles Guiteau, a lawyer who’s application to be the U. S. ambassador to France was denied, fired two shots at President Garfield. One bullet grazed the President’s arm but the other one had entered his back, fractured a rib and lodged itself somewhere inside Garfield’s body. Guiteau, a religious fanatic stated that he shot Garfield in order “to unite the Republican Party and save the Republic”. Guiteau readily gave himself up after the shooting – he reportedly had arranged to have a hansom cab wait for him outside to take him to jail because he was afraid that an angry mob would form and lynch him. The Washington police arrested him. Garfield, who never lost consciousness, was taken to the White House. Under the highest medical skill of the day, Garfield lingered between life and death for more than ten weeks. There were two methods of treatment at the time for bullet wounds. First, if the bullet had penetrated an organ, it would mean certain death without surgery to remove it. Second if the bullet hadn’t penetrated an organ it would be better to delay surgery until the condition of the patient stabilized. The first doctor to see the President, Dr. Willard Bliss stuck his finger into the wound (unsterilized) trying to probe and find the bullet. He never found it but the passageway that he dug through the President later confused physicians as to the bullet’s path. They concluded that the bullet had penetrated the liver and surgery would be of no help. They were wrong. In an effort to find the bullet, Alexander Graham Bell devised a crude metal detector. On July 26, Bell and his assistant, Tainter and Simon Newcomb (who originally had the idea of the metal detector) made their first attempt to locate the bullet in Garfield’s body. There were also five White House doctors and several aides present for the experiment. Garfield expressed fear of being electrocuted and Bell reassured him. The results of the experiment were inconclusive as there was a hum no matter where the wand was placed on the president’s body. Bell was unaware that the White House was one of the few that had a coil spring mattress that had just been invented. Very few people had even heard of them. 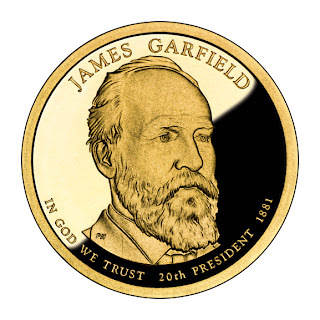 If Bell had moved Garfield off the bed, their apparatus would have detected where the bullet was and likely, knowing this, the surgeons could have saved James A. Garfield’s life. 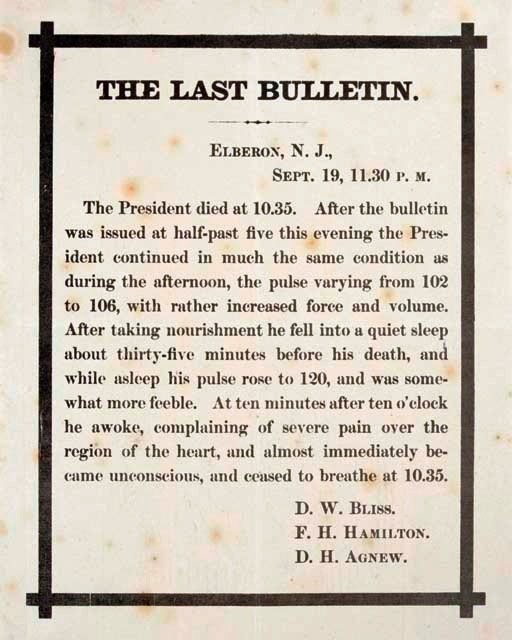 THE LAST BULLETIN dated September 19th, 1881 and issued from Elberon, NJ at 11:30 p.m. Garfield's doctors announce Garfield's death: "The President died at 10.35. After the bulletin was issued at half-past five this evening the President continued in much the same condition as during the afternoon, the pulse varying from 102 to 106, with rather increased force and volume. After taking nourishment he fell into a quiet sleep about thirty-five minutes before his death, and while asleep his pulse rose to 120, and was somewhat more feeble. At ten minutes after ten o'clock he awoke, complaining of severe pain over the region of the heart, and almost immediately became unconscious, and ceased to breathe at 10.35." In the end, the doctors had taken a three-inch wound and turned it into a twenty-inch gouge that was massively infected. On September 15, 1881, symptoms of blood poisoning appeared. Garfield lingered until September 19, 1881 when, after a few hours of unconsciousness, he died.